Perfect bulk purchase for teachers or resellers. Each CDs RRP is £24.99 and you get free delivery on every order. This is the perfect resource for parents or teachers who are preparing a child for the Music Aptitude Test (MAT) for a music place at a selective secondary school. 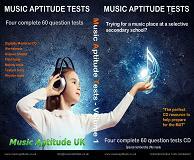 Four complete 60 audio question Music Aptitude Tests covering all core test requirements to give you the best chance of success. Pitch, Melody, Texture & Rhythm exercises to help train and prepare the candidate. Included is FREE access to online worksheets and answer sheets. Copyright © 2015 Music Aptitude UK. All Rights Reserved.